Two excellent games of Seven Wonders-Spiel des jahr 2011 by Repos Productions. A game of building ancient wonders. Easy to play but tactically hard as player interplay screws up your plans ur plans. 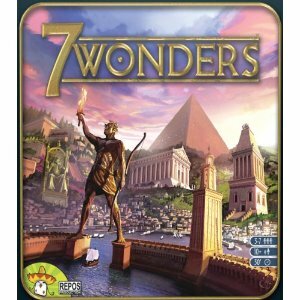 Seven Wonders-Its a Wonderful Game. Seven Wonders is a wonderful game. Many thanks to Sagar for bringing it along last night. We got through three games, each of them taking about 50 minutes. I did moderately well with the wonder Halicarnassus but stumbled creating civilisations around two others. Also played on other tables were Magic, San Juan, Carcassonne, 28mm WWII, Dark Heresy RPG and some 40k.